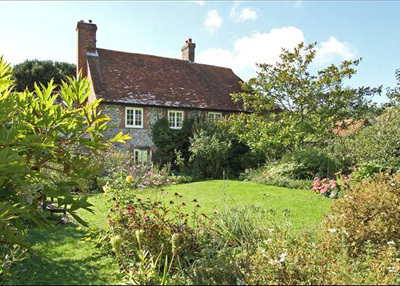 The Well House is a period farmhouse for sale near Compton in West Sussex. The property has origins back in the 15th century, and was subsequently extended in the 17th century, and is built of an original timber frame dressed with local stone. Period features include exposed beams and original fireplaces including a large Inglenook in the main drawing room. Downstairs the reception rooms and the kitchen are all an excellent size for a property of this age and upstairs are the master bedroom suite, four further bedrooms and the family bathroom. Accommodation in total comprises: entrance hall, drawing room, dining room, kitchen/breakfast room, study/bedroom six, wet room and cellar, five bedrooms and the family bathroom. Outside the house is surrounded on all sides by the mature gardens with lawns and pretty shrub borders, and some wonderful specimen trees. The property also benefits from extensive outbuildings and three paddocks; the grounds come to just under ten acres. The Well House is situated in a fine position just north of the West Sussex village of Compton which has a village shop. Wider amenities are available at Petersfield and Midhurst nearby. The guide price is £1.15m. For further information please contact Knight Frank on 01428 770 560 or visit http:///search.knightfrank.com.